Having split the atom and put a man on the moon, the federal government has funded its most ambitious project yet. Specifically, immortalizing the likes of Danny Biasone. Haven't heard of Biasone, the father of the 24-second shot clock? Then you probably haven't heard of the Greater Syracuse Sports Hall of Fame, either. Which, come to think of it, wouldn't be a total shock. Dedicated to the proposition that Syracuse, N.Y., is a world sports mecca, the Hall counts Biasone among its inductees and is notable for at least two reasons: (1) a dedication to the proposition that Syracuse is a world sports mecca; and (2) it does not include Jim Brown. Beyond that, one other factor separates the Syracuse Hall from its peers in the field of petty regional homage, fellow cultural meccas such as the Alabama Health Care Hall of Fame and the National Corvette Museum. Try $75,000. Of your money. Two years ago, Congress tacked a grant for the Syracuse Hall onto a larger appropriations bill covering Veterans Affairs and Housing and Urban Development. And no, it wasn't an accounting mistake. "It wasn't a great deal of money," says Dan Gage, a spokesman for Rep. James T. Walsh (R-N.Y.), the congressman responsible for the funding. "There are similar projects all across the country. This was no different from what is being done elsewhere." True enough. 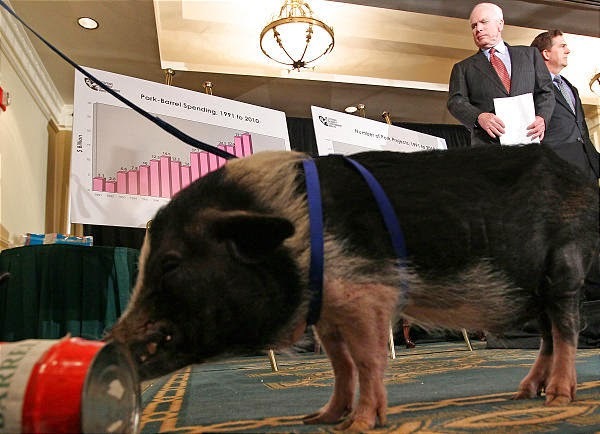 According to the nonpartisan watchdog group Citizens Against Government Waste, Congress spends more than $25 billion annually on pork-barrel projects -- budget-greasing, constituent-pleasing oinkers like the National Cattle Congress ($250,000) and the money-down-a-flushless-drain Waterfree Urinal Conservation Initiative ($1 million). The really upsetting part? Some -- too much -- of that largesse goes to sports. Think $1 million for the First Tee youth golf program. Nearly $73,000 to build a miniature red-brick replica of Oriole Park at Camden Yards. A cool $35,000 for the Alabama Sports Hall of Fame, which also doesn't honor Jim Brown. Just this year, the same spendthrift legislative body that once signed off on $640 Pentagon toilet seats and a $50 million indoor rain forest -- in Iowa, of all places -- approved $50,000 for the Capitol Hill baseball and softball league. Pay taxes? Thanks in advance. But don't expect a free league T-shirt. "It's incredibly ridiculous what we'll spend money on," says Rep. Jeff Flake (R-Ariz.), a vocal critic of excessive federal spending. "Pork is just out of control." Is it ever. Gaze upon your W-2s, America. And despair. The Pennsylvania Hunting and Fishing Museum gets $100,000. A program encouraging Iowa residents to exercise and eat healthy food gets $200,000. Why are Flake's distinguished colleagues so eager to spend the people's moolah on stuff like the U.S. Soccer Foundation ($950,000)? Simple. Pork paves the road to reelection. Quid pro quo. Rep. Walsh's district hosts the Syracuse Hall. The Richard Steele Boxing Club -- recently awarded a $100,000 federal earmark -- is located in Henderson, Nev., home state to Senate appropriator Harry Reid (D-Nev.). Citizens Against Government Waste calls Sen. Robert Byrd (D-W.V.) "the King of Pork," a fitting title for a man with more than 30 federally funded projects to his name. (No, really -- they're named after him). The Monarch of White Meat is also the longest-serving senator in American history. "I had an opponent in my last election that said, 'We need to vote Flake out because he doesn't bring home the bacon,' " Flake says. "You don't want your neighboring congressman's press release to be longer than yours." Heaven forbid. Which is why many members of Congress view pork projects the way the rest of us view screaming infants: irritating and cringe-inducing when they belong to someone else, cute n' cuddly when they're your own. Take the mini-Camden Yards. Located in Aberdeen, Md., the ballpark is being built by the Cal Ripken Sr. Foundation and will serve as the centerpiece of a baseball program focused on at-risk youth. "A program like this will save a lot of kids that could have gone the other way," says Rep. Dutch Ruppersberger (D-Md. ), who helped secure funding for the stadium. "I find it really offensive that you're attempting to help underprivileged children, and it's being called pork." Ruppersberger has a point: like many pork projects, the Ripken stadium sounds worthy. But worthiness isn't the problem. Financial solvency is the problem. Between an estimated deficit of $300 billion and escalating bills for Hurricane Katrina reconstruction and the war in Iraq, the federal government simply can't afford to fund character education through youth-league baseball. Not without borrowing even more cash. Speaking of money and Iraq: Last summer, Ruppersberger praised the staff at the U.S. Army proving ground in Aberdeen for creating Humvee armor that helps protect soldiers, the same front-line troops the federal government has struggled to reimburse for self-purchased body armor. Do the math. That $73,000 Congress spent on Ripken Stadium? It could have purchased 48 armor-plated vests at $1,500 a pop. Every dollar spent on sports pork is one less dollar spent on something more important. Worse still, many pork recipients don't really need the money. Remember the First Tee? The organization boasts a $5 million operating budget and a trustee list that reads like a Who's Who of CEOs. Congress still forked over $1 million in 2004. Last year, the Tiger Woods Foundation received a $100,000 grant toward the construction of an education center in California, despite the foundation's reported net assets of $32.6 million and a namesake who annually earns $50 million-plus. From 2002 to last year, the Baseball Hall of Fame received a total of $1.57 million to produce once-a-year educational broadcasts covering topics such as women in baseball and the physics of pitching. $1.57 million. That's less than one percent of the New York Yankees' payroll, and not even equal to Alex Rodriguez's salary for a single month of the season. "Why do they need the American taxpayer?" asks David Williams, policy vice president for Citizens Against Government Waste. "Baseball is flush with money." Outraged yet? You should be. Yet before you blame Congress, take a long look in the mirror. Representatives carry out the people's will. And when the people are all too willing to let their duly elected officials drop $400,000 on the University of Rhode Island's Institute of International Sport and $990,000 on a California soccer center, all without a single peep of protest -- well, we get the bloated federal budgets we deserve. More than that, we get budgets we demand. Just ask John Rathburn, president of the Syracuse Hall. As a taxpayer, would he have voted to fund the Alabama Sports Hall of Fame? "If I thought it would benefit the community," he says, "I would say yes." Yes. The three-letter word that makes sports pork possible, the three-letter obscenity that makes Flake want to cry. And laugh. And cry some more, an overstuffed appropriations bill in hand. After all, Rathburn's sentiment is hardly unique: two years ago, government dollars went to the Country Music Hall of Fame ($250,000), the Rock and Roll Hall of Fame ($350,000), even the Paper Industry Hall of Fame ($70,000). "The National Cowgirls Hall of Fame was in there, for crying out loud," Flake says, sighing. "I'd like to nominate some of my colleagues for the National Pork Barrel Hall of Fame."